Research by Mindapples and the mental health charity Mind in 2013 showed that popular knowledge of the mind is quite low in UK society. Of the representative sample of people we surveyed, more than half had never thought about the health of their minds before, and 56% wanted to know more about their mental health and wellbeing. We know our minds are important though – 84% of respondents judged their mental health to be as important as their physical health – but the topic is not discussed openly enough, and we have not been equipped with the knowledge and tools we need to look after ourselves. 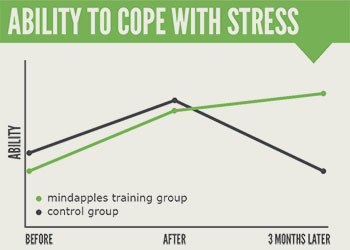 To address this, Mindapples has spent five years developing and testing a new education programme that shares practical insights about how the mind works, and helps people apply this knowledge to how they live and work. Drawn from psychology and neuroscience, reviewed by experts and successfully tested in clinical trials, this is a new kind of psychological literacy programme that can benefit people of all ages. We offer digital wellbeing training and e-learning to put this knowledge directly in the hands of organisations and the public, so if you’re interested in purchasing a subscription for your organisation, find out more here. We also sell training programmes and workshops for organisations, to help people work smarter and maintain their wellbeing. We also occasionally do public talks and workshops, so join our mailing list for details of those. We also train people to deliver our training, to give as many people as possible access to this valuable content. So if you have people in your organisation who care about mental health and wellbeing, and might want to share this content with others, get in touch. Finally, if you want to learn about your mind now and can’t wait for events or e-learning, we’ve turned our training materials into an award-winning book, A Mind for Business. Written by Mindapples’ founder Andy Gibson, the book is targeted at business people but it shares all the key insights from our training in a handy, portable form. Our training materials share proven insights from neuroscience and psychology to help people understand their minds and improve their health, work and relationships. 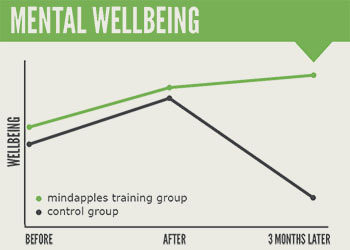 As you’d expect from Mindapples, the programme is divided into digestible, bitesize chunks, and individual reflection and group discussion form a major part of the process. Our training programmes are based on rigorous academic and clinical insights and have been independently evaluated by the University of York to improve the wellbeing, resilience and psychological literacy of participants. Our services are available as standard packages and tailored programmes, and discounts are available on block bookings. Contact us to build a programme that suits your needs.